Window coverings were never a priority. Inexpensive mini-blinds, solid-color blackout curtains to keep the sun from waking you in the morning, or a sheet tacked above the window. Really, anything functional and providing privacy was sufficient even if it wasn’t pretty. Then one day you see some curtains and fall in love. You have no idea where you’ll hang them, but they’re too cute and not that expensive. You purchase several panels so there’s enough to work with once you decide on the perfect place to hang them. Several years ago, I saw some curtain panels at IKEA. I loved the playfulness of their design and just had to have them even though I didn’t know where they would hang in my home. Like many of IKEA’s products, they were reasonably priced. 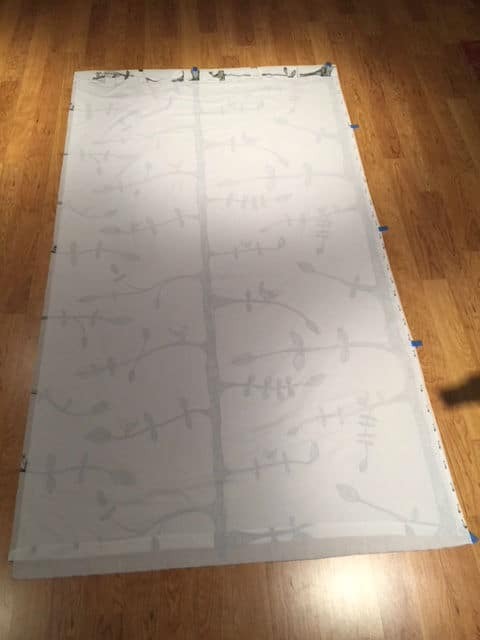 I bought several panels to make sure I had enough fabric for the elusive “someday” in the future when I would decide where to hang them. When I made my bedroom the focus for September in the 2017-2018 School Year Challenge, hanging curtains was one of the projects I wanted to accomplish. There wasn’t a design vision for the master bedroom. I just knew I wanted something else covering the windows beside the mini-blinds that were there when we bought the house. 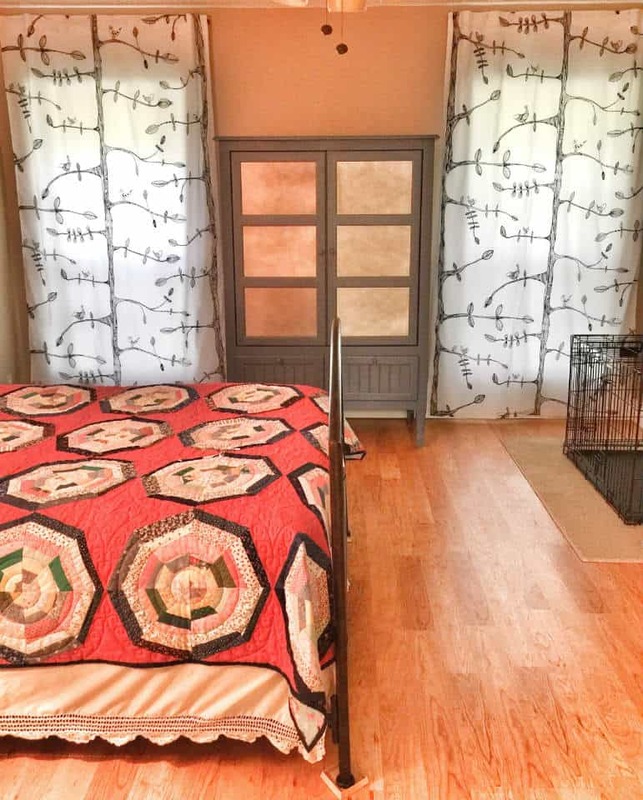 The playful design on the IKEA curtains still appealed to me and I knew I would enjoy seeing them every day, so I decided to hang them in the master bedroom. My plan was to take down the mini-blinds but the curtains were fairly sheer. Therefore, I would need to add a lining to them. 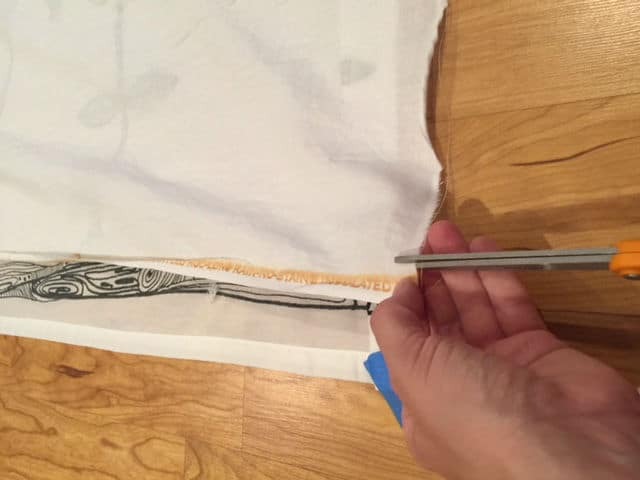 The Roc-Lon Ⓡ Rain-No-Stain lining I purchased was about the same weight as the curtain fabric. The weight is what drew me to this liner initially. Because the curtain and liner were a light to medium weight, they would hang and move in a similar fashion. The clincher for selecting this lining was the description on the tag about being resistant to sun, moisture, stains, and creasing. In addition, it advertised being able to regulate indoor temperature year-round. First, our dog Caramel spent a lot of time looking out the bedroom windows. Unsure of how much oil and dirt would transfer from her fur and face to the lined curtains, I figured any stain resistance would be beneficial. Second, the windows were the original single pane windows from when the house was built in the late 1970s. Condensation on the inside of our windows wasn’t uncommon. Also, both heat and coolness could be felt coming through the windows depending on the time of year. The Roc-Lon Ⓡ Rain-No-Stain lining wouldn’t stain from moisture or Caramel, would make the curtains a more effective insulator, and provide privacy. According to their labels, both the lining and the curtains were machine washable. I pre-washed both prior to measuring because the finished look I wanted required the curtains to be slightly wider than the width of the window. Also, I wanted to know the final length of the curtain before I hung the rod. One curtain panel was enough for each window. However, a panel was several inches wider than the window resulting in a slightly gathered look when the curtain was closed. 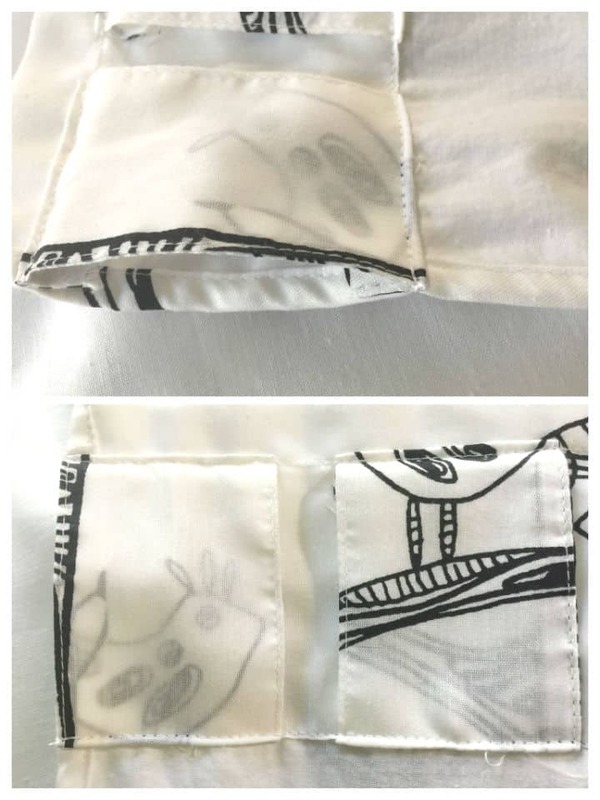 Even though the fun illustrations were still visible, there was almost too much fabric and some of the design was lost in the slight folds. 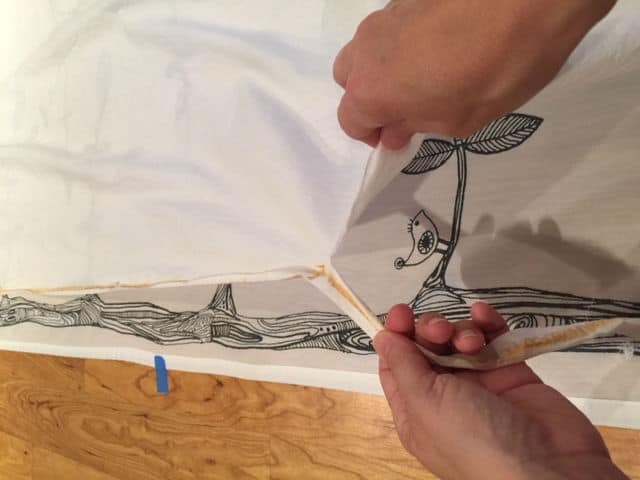 I wanted to be able to see the whimsical drawings of birds, trees, and leaves, so I didn’t want there to be a lot of folds in the curtains when they were closed. I had to make a decision…Would I cut some width off the curtain or leave the panel alone? This decision was made for me when I measured the width of the lining. It wasn’t as wide as the curtain, and it was the exact width to achieve the look I wanted. Decision made! I would need to cut some width off the curtain to fit the lining. 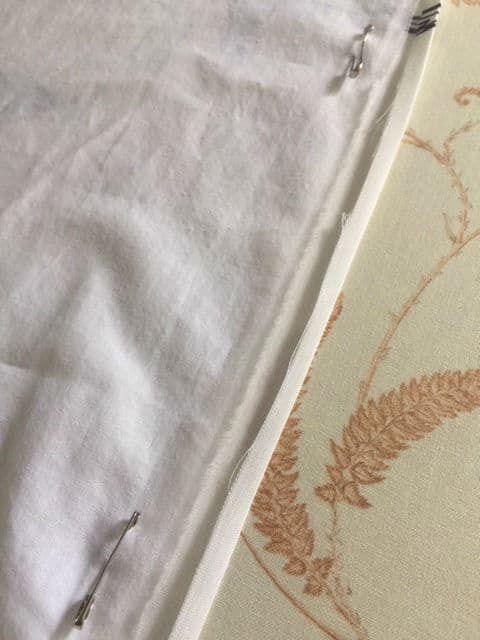 Now that I had the curtains, the lining, and the final measurements, I was ready to get to work. 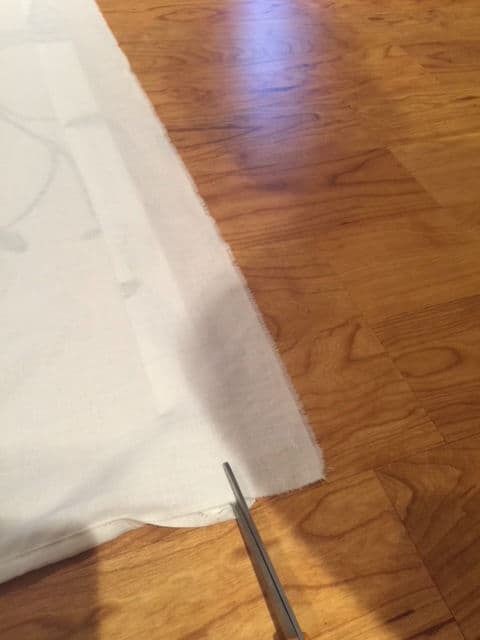 Working with one panel at a time, the steps described below are how I attached a lining to a store bought curtain. I cut width off each curtain panel to achieve the look I wanted. You may not need to do this. I did one curtain panel at a time just in case something didn’t work the way I thought it would. Then I could make adjustments on my process for the second panel. 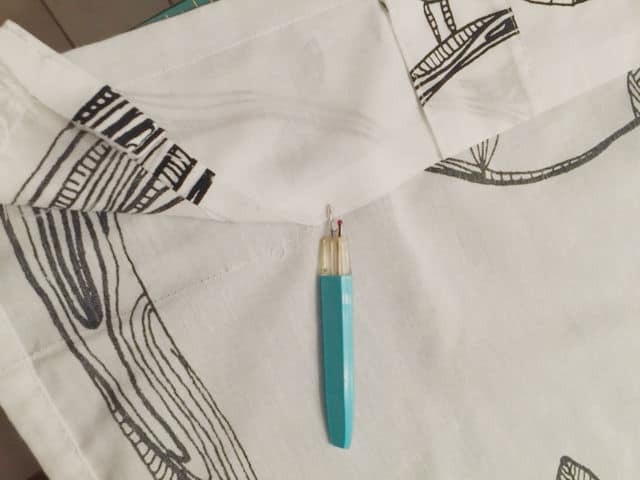 Using a seam ripper, open up the seam of the facing located at the top, or header, of the curtains. This will also release the bottom of the tabs used to hang the curtain on a rod. 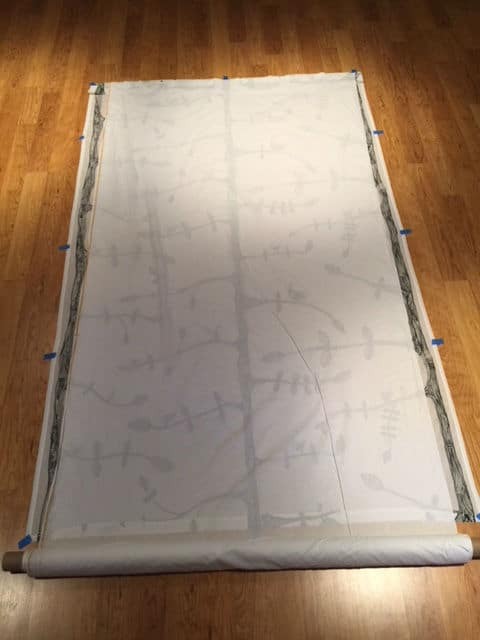 Using painter’s tape, secure the curtain to the floor (wrong side up). The curtain should be taut but not stretched. Make sure there are no wrinkles. 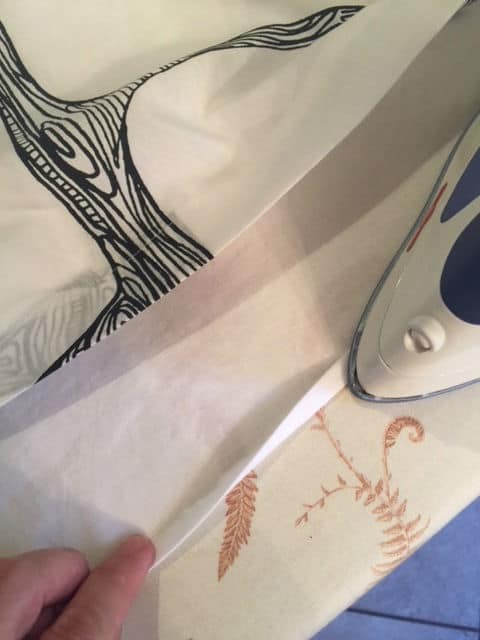 Roll out the lining so it covers the curtain. Snip the lining in a spot just past the end of the curtain. Grip both sides of the snip between your fingers and tear the lining all the way to the other end. This will make a terrible sound and may be slightly traumatic. However, it’ll result in a straight edge when you’re ready to hem the lining. 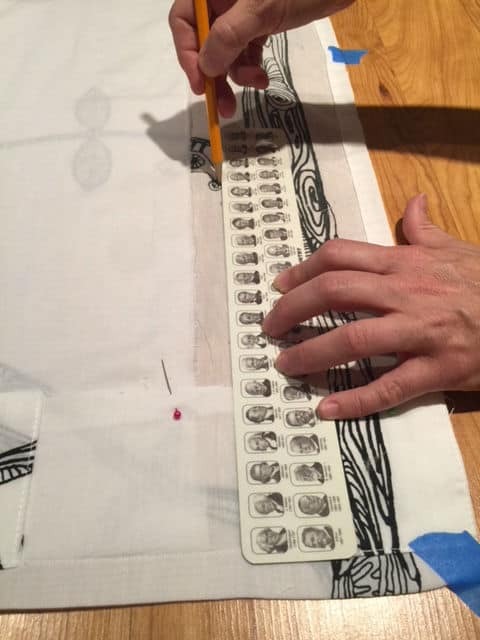 If there’s print on the selvage and it can be seen through the curtain, make a snip just on the inside of the selvage. Grip both sides of the snip and tear it for another straight edge. Place the lining under the header. Line up the top edge of the lining with the top of the header underneath the facing. 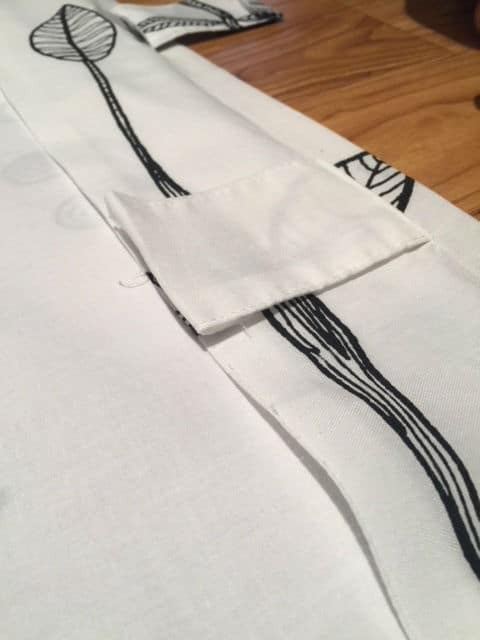 Note: Because I knew I’d be hand sewing the lining down the uncut, lengthwise side of the curtain, I made sure the selvage edge of the lining I didn’t tear was lined up in the center of that finished seam allowance. 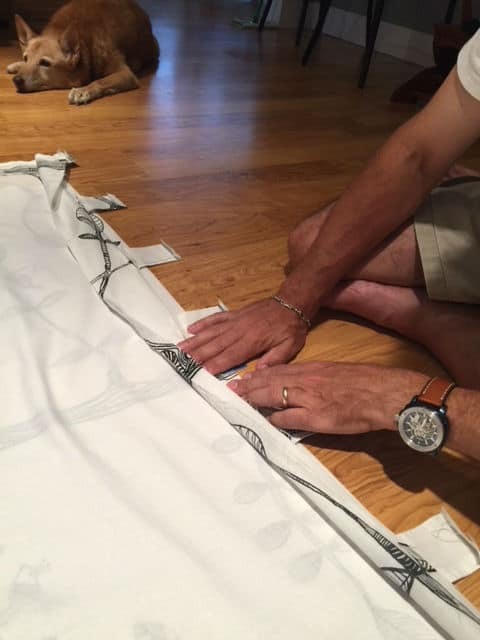 In the picture below, my husband is holding the lining in place under the header while I’m getting the uncut selvage in place on the uncut seam allowance on the curtain and pinning it down. 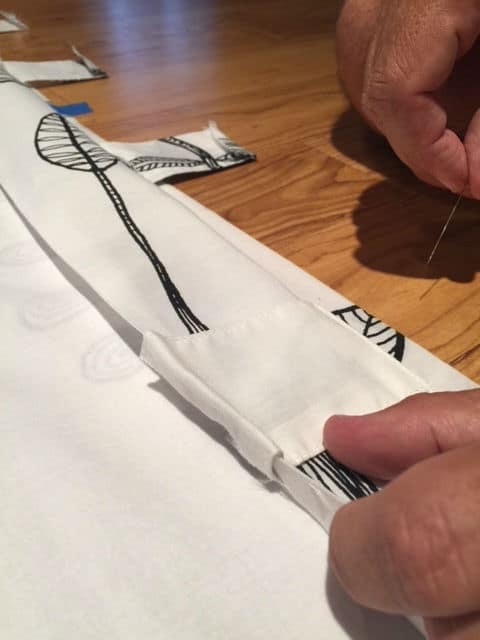 If you don’t have an extra set of hands, you can pin the lining in place under the header facing. You may have to fuss a little to get everything lined up and smooth. Lay the header facing over the liner and smooth it out. Tuck the edge of each tab between the liner and facing. Pin the tabs in place. 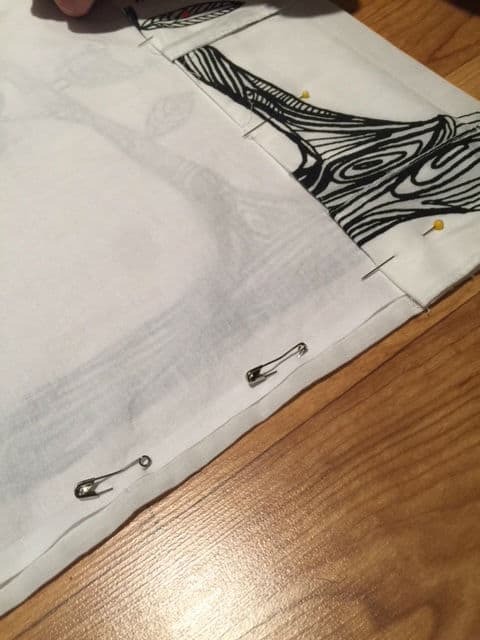 Add additional pins to secure the rest of the header. Note: I used straight pins to anchor the header because I would be sewing this down with the sewing machine. I used safety pins to anchor the uncut selvage because I would be sewing this down by hand. The picture above is what I mentioned earlier when I didn’t have a picture of the process to show you. 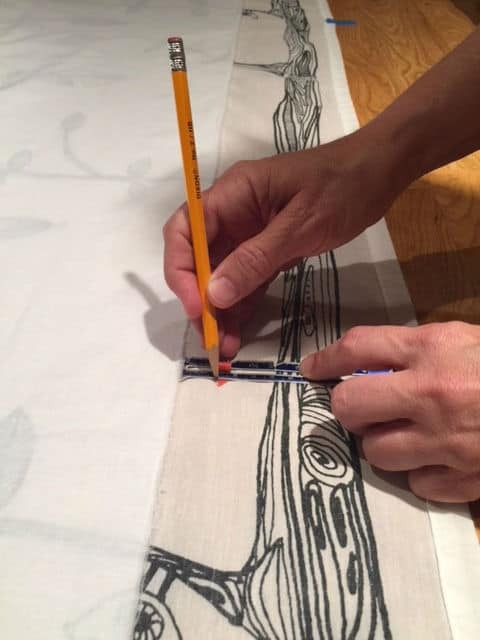 The uncut selvage of the lining is safety pinned in the middle of the seam allowance of the uncut edge of the curtain. The steps in this section were done because I wanted the curtain to be the width of the lining. 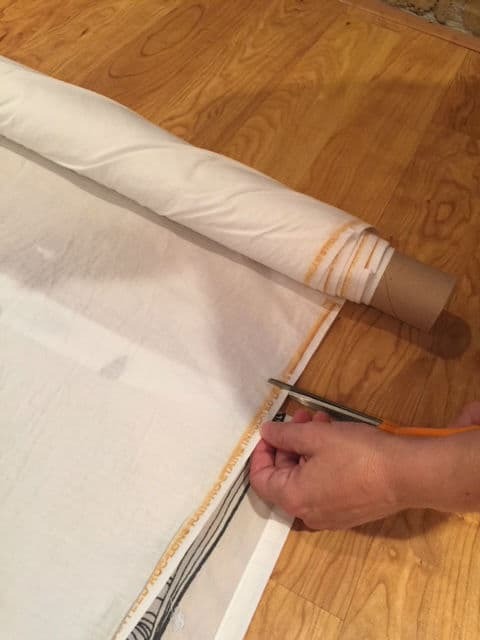 Making sure there are no wrinkles, measure in intervals 1” from the edge of the liner along the length of the curtain including the header. 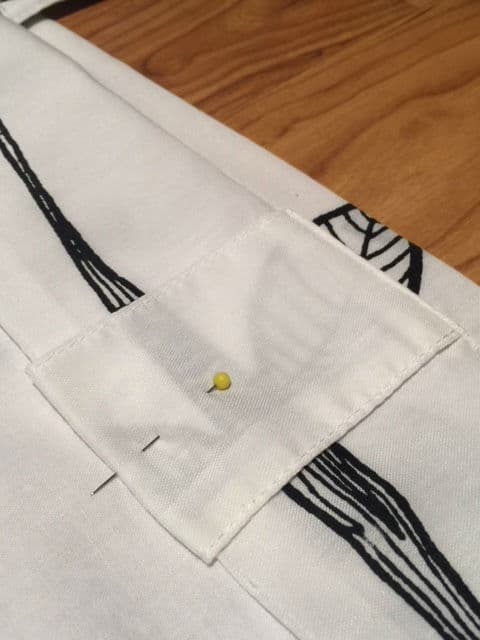 Note: You may need to remove a tab from the header and reattach it after you prepare and sew the cut edge. Connect the dots using a ruler. Cut along the line. Smooth out the liner and use a few safety pins to hold it in place. The picture below shows the curtain and liner after they have been prepared. They’re ready to be sewn together across the header and on the uncut (right) side of the curtain. 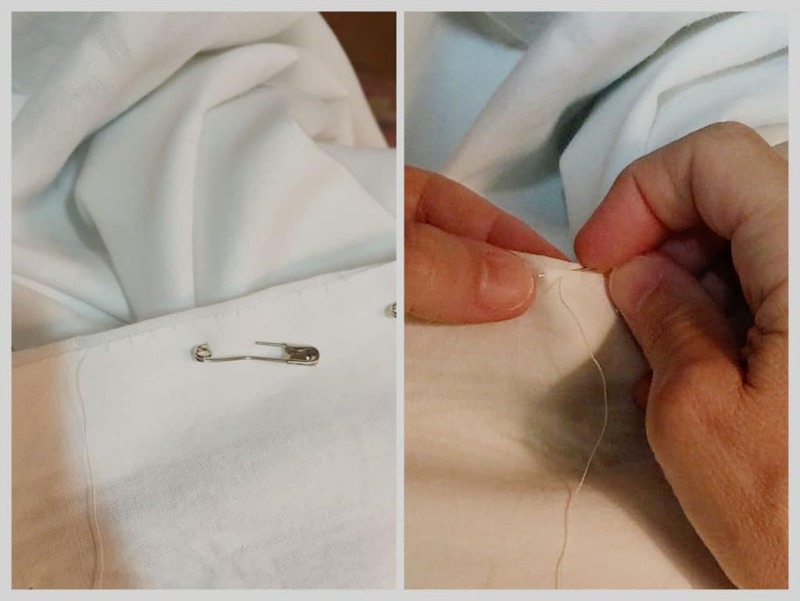 Using a straight stitch on the sewing machine and with the wrong side of the curtain facing up, sew ⅛” to ¼” from the folded edge of the header facing. This secures both the facing and the tabs the curtain rod will go through. 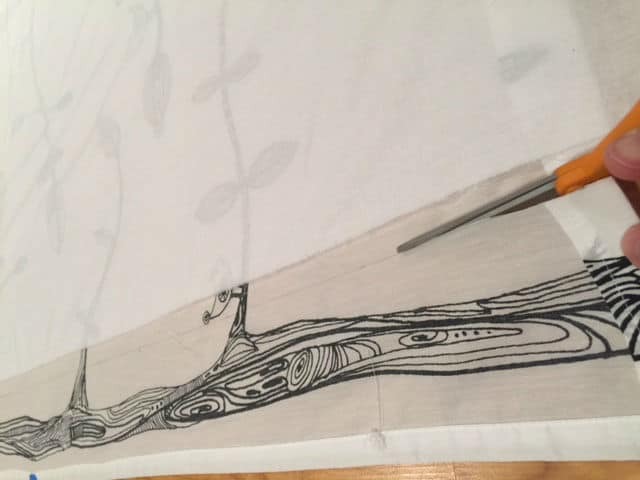 Using a whip stitch, hand sew the selvage edge of the liner to the seam allowance of the uncut edge of the curtain. The seam allowance should be two layers of material. As you sew, the wrong side of the fabric is facing you. The needle does not go through to the front of the curtain. You should only be catching the top layer of the curtain that is in the seam allowance. Note: Leave a few inches free at the bottom of the curtain. This will make it easier when it’s time to finish the bottom of the lining. It’s now time to prepare the cut length of the curtain. First, fold and press approximately ⅜” of the curtain’s raw edge to the back of the curtain. 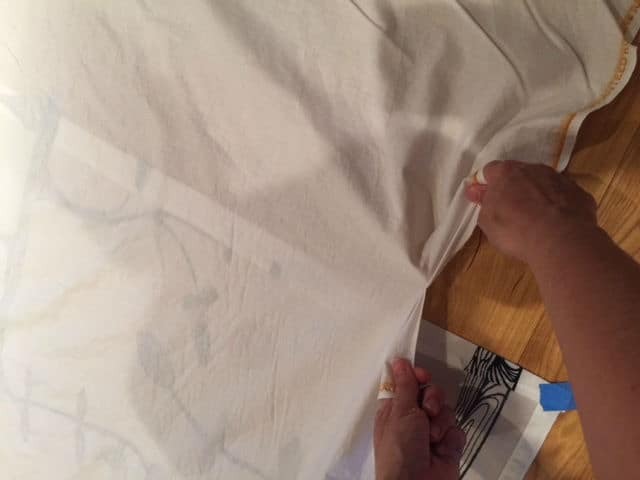 Then fold the edge again so the raw edge of the lining is covered by the folded edge of the curtain. Press. Pin in place. 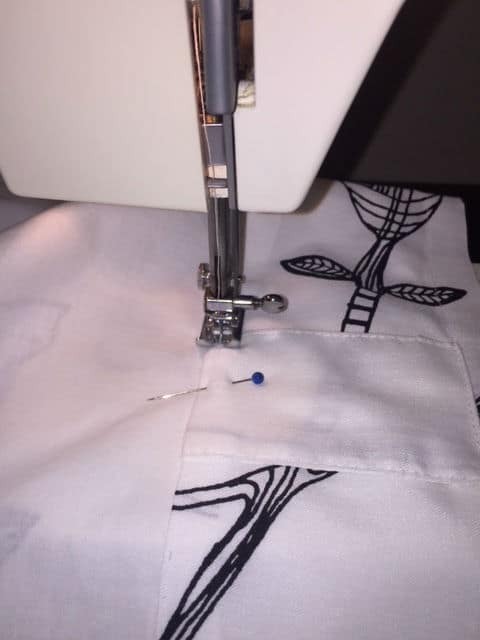 Using a straight stitch, sew this prepared side on the machine with approximately a ¼” seam allowance. 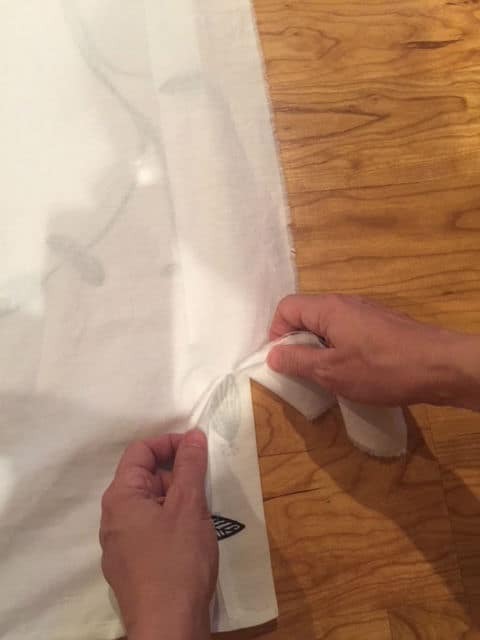 Make sure the seam secures the raw edge of the curtain. Note: Again, leave a few inches free at the bottom of the curtain. This will make it easier when it’s time to finish the bottom of the lining. Sheesh. The picture above is the only one I took of the steps in this part of the process and in finishing the header that is described next. (I must have been excited I was almost finished.) So sorry! If you have questions, ask in the comments or send me an email. To see the edge of the finished header, look at the two-picture collage below. The top picture that shows the finished edge of the header has the reattached tab on it. You can see the finished curtain edge that was cut, folded, pressed, and sewn. The reattached tab is on the left in the bottom picture. I put the tab here because it provides the needed support for the curtain to hang on the rod correctly. Lay the curtain and attached liner on the floor. Smooth out any big wrinkles. Snip the liner approximately 1/2″ from the bottom of the curtain. 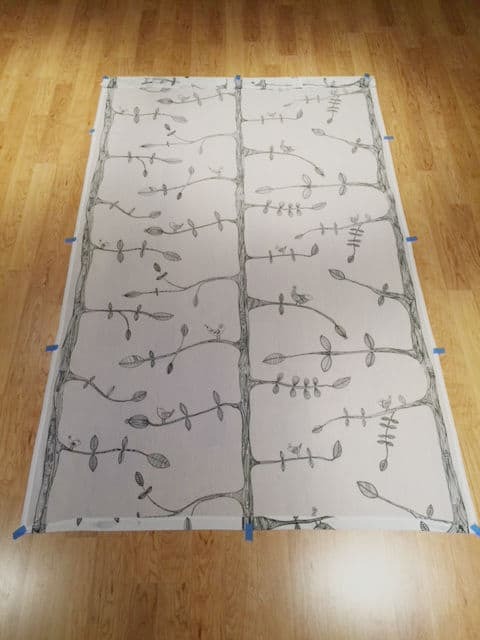 The lining will be shorter than the curtain. Grip both sides of the snip and tear it so you get a straight edge. Just like preparing the cut edge of the curtain, fold and press approximately ⅜” of the lining’s raw edge. Then fold the edge again so the raw edge of the lining isn’t visible. Pin in place. It should be shorter than the length of the curtain. There were no issues with this process so I didn’t need to tweak anything. Repeat the steps if you have more than one panel. The curtains are ready to be hung! 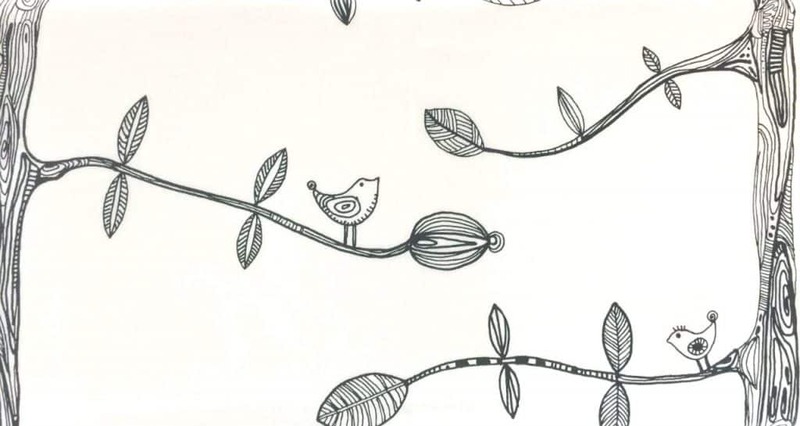 Playful curtains that are now lined! When window coverings aren’t a priority, but you fall in love with a store-bought curtain, don’t pass it up if the price is right. 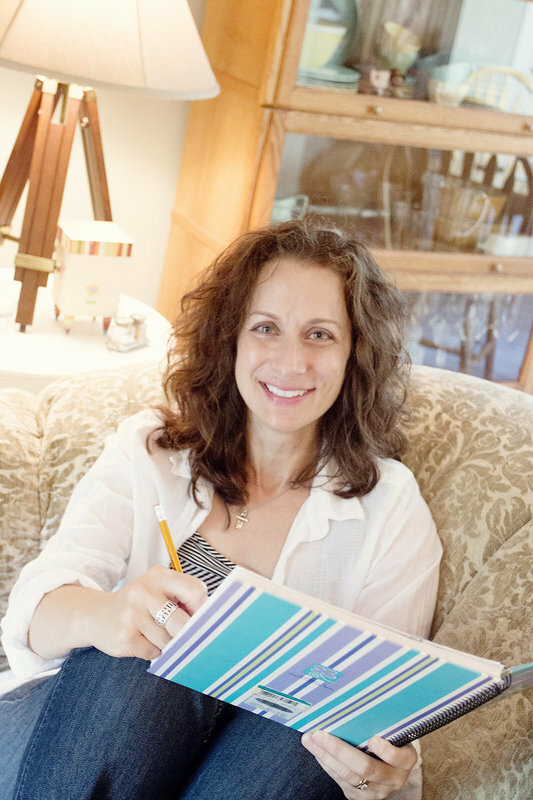 You may not know where it’ll hang but basic sewing skills can help you achieve the look you want when you are ready.